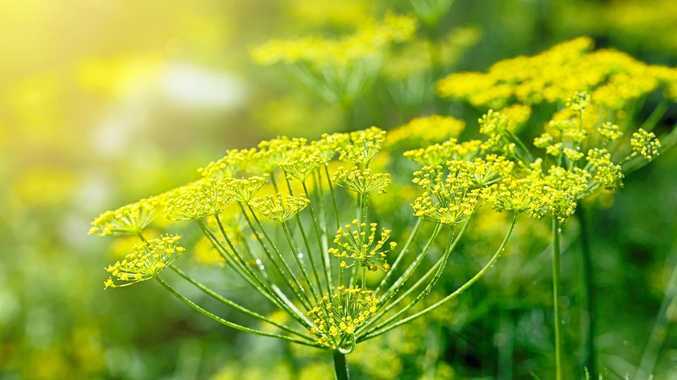 Dill (anethum graveolens) is a traditional aromatic and versatile annual herb that can add delicious flavour to a range of dishes including seafood, quiches and tarts, salads and even breads and savoury muffins. Dill seeds can be sown throughout Australia during summer, both in the ground and in pots. It doesn't like to be transplanted, so sow seed where it is to grow. The easiest way to sow dill is to lightly scatter seed over the soil surface then cover with a thin layer of seed-raising mix. The seed should only be buried about 1mm. Gently firm down the dirt with your hand or spade. Keep the soil or potting mix moist while the seed germinates (about 10-12 days) and the seedlings establish. Thin any excess seedlings so the plants are about 20cm apart. Grow dill in a sunny, well-drained spot that is protected from the wind. The ferny foliage can be picked from about eight weeks after planting. Feed dill plants regularly with a complete plant food to promote lots of healthy leafy growth. If left to flower, dill's pretty yellow flowers will attract bees and other beneficial insects - some will help to control insect pests such as aphids.